Anyone attached to Greece (and I am one of them) knows moussaka, one of the most traditional dishes of the Greek kitchen. I have mixed feelings on it, even though I love all ingredients of this oven dish with aubergines as main ingredient. How come? Many Greek chefs add cinnamon to the dish, in addition to many other herbs and spices, and that more or less spoils it, because cinnamon is rather dominant and I happen to like it only in sweet dishes. Maybe a little blasé, in the light of this article? Hans Tramper is professor emeritus in Bioprocess Technology at Wageningen University and reflects on the development of his subject in a series of essays. His pieces were published so far on 18 June, 30 June, 11 July, 22 July, 19 August , 10 September, 21 September, 30 September and 10 October 2018. Aubergines come in many shapes and colours. 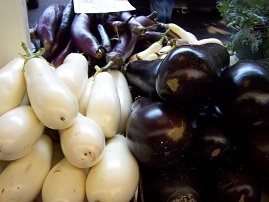 The eggplant belongs to the nightshade family and originates in Myanmar. In the Middle Ages, the Arabs imported the plant in Spain and from there onwards, the aubergine spread across Europe. Dutch supermarkets sell aubergines throughout the year now; Dutch horticulturalists take care of supply during the months of February through November. They mainly grow the elongated, shiny, deep purple variety. In Southern and South-eastern Asian countries many farmers grow aubergines, that they call brinjal; they are a popular food. Economically and nutritionally, it is one of the most important products. But the eggplant is readily attacked by vermin, in particular the larvae of Leucinodes orbonalis, the ‘fruit and shoot borer’. Farmers can only control this harmful caterpillar by spraying a lot with a broad-spectrum insecticide, containing notably organophosphorus compounds like malathion. In order to prevent crop failure, farmers therefore spray a lot, often far too much, up to 20-70 times during the growth season, and over a hundred times per season is not exceptional. Better spray too much than starve. Nevertheless, all by its own this insect is responsible for a loss of 30 to 60 percent of the yield. The cost of insecticide use may be as much as 35 to 40 percent of total costs. In Europe, many of these insecticides are banned because of their toxicity. Farmers seldom use protection, and often suffer from vomiting, itching, red eyes, muscle pain and headache. Traces of these insecticides can be found in the soil and in the harvested fruit. In short: detrimental to the health of both consumer and grower, bad for the environment. Against this background, it will not surprise us that much value is placed on the search for an eggplant that is resistant to this caterpillar. Research conducted in India, the Philippines and Bangladesh early this century has concluded that the Bt aubergine is the most promising variety. 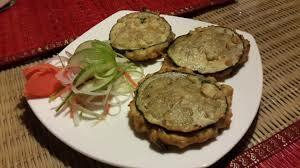 In Bangladesh, the brinjal (aubergine) is a popular food. The Indian company Mahyco used a Bacillus thuringiensis cry1Ac gene, a verified safe gene, to produce an eggplant variety that is resistant to the harmful caterpillar. This gene has already often proven its value in Bt cotton. The Bt eggplant produces the specific Bt protein and in doing so, protects the plant against the harmful eggplant caterpillar. Farmers using this variety need to spray a lot less insecticides; a reduction of 92% has been proven in actual practice. The only reason for an occasional treatment is a possible attack by other insects like flies and spiders, but this results in much less use of toxic substances. Most other insects, and birds, mammals and humans, are immune to the Bt protein; this by the way is one of the components of many bio-insecticides that have amply proven to be effective in organic agriculture. Researchers developed several varieties of Bt eggplants, which were offered for regulatory approval in the three countries concerned. In India, official approval was expected in 2009, but that was prevented by the responsible minister who acted on public accusations that there were too few data to warrant safe consumption of the crop. In 2010, this minister even issued a moratorium on the commercial release of Bt aubergines. New field trials were initiated in 2014 by the then new government, but according to local news media, Greenpeace and other antis pleaded successfully at the Supreme Court for continuation of the ban on field trials – it is still effective. In the Philippines we see a comparable sequence of events. On December 8, 2015, the Philippine Supreme Court confirms the decision of the Court of Appeal to ban trials with Bt aubergines permanently. The Court even goes a step further and declares void an order issued in 2002 by the Ministry of Agriculture containing rules for imports and use of GM plants and GM vegetal products. Why banned in the Philippines too? Philippine researchers test Bt aubergines between 2010 and 2012 on some of the most representative lands for growing vegetables in the Philippines. They not just measure the expression of the Bt protein, the insecticide, but also the number of harmful insects on each plant. These field trials show undeniably that the BT eggplants do not need spraying at all with a conventional insecticide, as they protect themselves to a degree of 95-100%. But although these plants promise many environmental and health benefits, still some activists oppose them with a great fanfare. In 2012, Greenpeace vandals even destroy a test field, ironically not one with Bt aubergines, but in the ‘safety zone’ with common eggplants serving to capture any genetically modified pollen, the required biological precautionary measure for scientific research on genetically modified crops. That’s when I started to follow events closely and write the first draft of this essay. Fortunately, the researchers by then have gathered enough data for a much discussed article. It is published in the reputed PLoS One journal. Shortly after their vandalistic action, Greenpeace files a complaint against the researchers, and in September 2013 the Court of Appeal imposes an administrative ban on field trials with Bt aubergines for fear of health and environmental damage from the crop. In April 2014, a group of farmers requests the Philippine Supreme Court to repeal this ban. But over a year later, December 8, 2015, the Supreme Court confirms the ban imposed by the Court of Appeal, as mentioned above. In Bangladesh on the other hand, the course of events is completely different. In October 2013, after years of greenhouse and field trials, the Bengal government approves the release of Bt eggplants for seed production and commercialization. Bangladesh, the most densely populated country in the world with the exception of some city-states, is expected to hit the mark of two hundred million inhabitants soon, from one hundred and sixty million now. There is much poverty and they use each and every piece of land. Add to that the floodings and the failed harvests, and one gets the picture of this country’s huge problem: how to feed the population sustainably and safely? 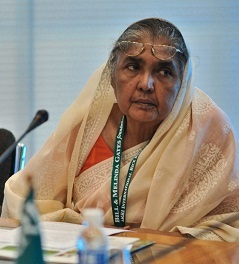 It may be the main reason why its government, in particular the honorable minister of agriculture Mrs. Begum Matia Chowdhury, decides in October 2013 to approve growing GM eggplants. This in contradiction to neighbouring and other developing countries, and notably, most EU countries. The Bangladesh Agricultural Research Institute (BARI) obtains the Mahyco Bt eggplant through a public-private partnership between Mahyco, Cornell University, Sathguru Management Consultants, BARI and USAID (United States Agency for International Development). This cooperative agreement ends in 2014, but is extended in the following year in the form of the South Asia Improvement Partnership, in order to scale up further this already successful project, and conserve its success. Bangladesh now has some 20 aubergine varieties, each with characteristics of its own, for instance in the form of a rugby ball or a football, whereas some are tastiest in a curry and others are better on the grill. In order to retain diversity, plant scientists at BARI crossbreed the Bt gene in as many local varieties as possible, allowing farmers to continue to grow their favourite varieties. In October 2013, the institute obtains a permission to grow a limited number of four of the nine Bt varieties that BARI has developed. They start this program on October 30, 2013 and distribute the seedlings of the four varieties over 20 farmers in four districts. These first farmers start off early during the wet season in 2014. Considering the large number of farms in Bangladesh, some seventy million, often done just by manual labour, this transgene crop project has started on a very humble scale. During the late 2014 dry season and the early 2015 wet season, BARI investigates research and demonstration projects on testing farms, totalling 108 projects in 19 districts. In 2015-2016 they perform demonstration projects on 250 farms in 25 districts, and in 2016-2017 on 512 farms in 36 districts. In 2017-2018, BARI provides 569 farmers in 40 districts with Bt aubergines seed. In addition to that, the Department of Agricultural Extension provides seeds to 6000 farmers in 2016-2017, and in 2017-2018 to an additional 7000 farmers. And there is more. The Bangladesh Agricultural Development Corporation sells Bt aubergines seeds to 17,950 farmers for next to nothing. What does this boil down to? Twenty farmers grow Bt aubergines in 2013-2014, in 2014-2015 they number 108, and in 2015-2016: 250. This number grows explosively to 6,512 in 2016-2017, and even quadruples to 27,012 in 2018. According to Tony Shelton, professor in entomology at Cornell University, who oversees the program together with Jahangir Hossain, they may number even more as there are no restrictions on saving, using anew or even selling the seed. The number of eggplant farmers is estimated at 150,000, which boils down to at least 17% of them growing Bt aubergines. And… reap its benefits. A preliminary analysis by BARI concludes that Bt aubergines generate a good harvest for ninety percent of the farmers who participate in the program. Researchers found the caterpillar in less than one percent of the plants. In short, smallholder farmers in Bangladesh profit from Bt aubergines: better yields per hectare, more profit per hectare, less damage done by caterpillars and a strong reduction in the number of treatments. Jahangir Hossain summarizes: ‘Farmers growing Bt brinjal in Bangladesh are seeing three times the production of other brinjal varieties, at half the production cost, and are getting better prices at the market.’ In short, perfectly in line with what the Philippine researchers wrote in the quoted PLoS One article. The Bt aubergines project is a thorn in the flesh of opponents of genetic modification. One of the reasons is that the Bt gene used has originally been supplied by Monsanto, the former market leader in the area of gentech crops, now a subsidiary to Bayer. Notwithstanding the gene having been donated for free to the project, the opponents fear that this is a sly way to obtain a licence to act if the project might be a success. That might reinforce the almost monopolistic position in the food chain of this much hated Western company, that’s now been swallowed by an even bigger giant. Opponents fear moreover that gentech crops will harm both human health and the environment, their old hobbyhorse for which they cannot produce a thread of evidence. Bengali policy makers take a down-to-earth and logical view: in order to feed sustainably a populous country like Bangladesh, one needs to use the newest technologies available. The positive results will induce Bangladesh to make more use of gentech crops in the future. Golden rice will be their next project. Controversies on genetic modification: what’s wrong with Monsanto?